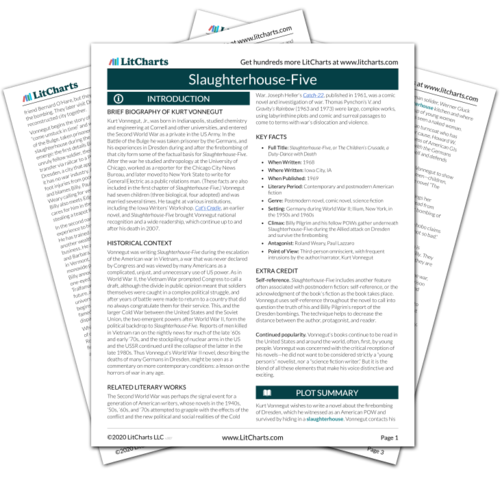 Welcome to the LitCharts study guide on Kurt Vonnegut's Slaughterhouse-Five. Created by the original team behind SparkNotes, LitCharts are the world's best literature guides. A concise biography of Kurt Vonnegut plus historical and literary context for Slaughterhouse-Five. A quick-reference summary: Slaughterhouse-Five on a single page. In-depth summary and analysis of every chapter of Slaughterhouse-Five. Visual theme-tracking, too. Explanations, analysis, and visualizations of Slaughterhouse-Five's themes. Slaughterhouse-Five's important quotes, sortable by theme, character, or chapter. Description, analysis, and timelines for Slaughterhouse-Five's characters. Explanations of Slaughterhouse-Five's symbols, and tracking of where they appear. Kurt Vonnegut, Jr., was born in Indianapolis, studied chemistry and engineering at Cornell and other universities, and entered the Second World War as a private in the US Army. In the Battle of the Bulge he was taken prisoner by the Germans, and his experiences in Dresden during and after the firebombing of that city form some of the factual basis for Slaughterhouse-Five. After the war he studied anthropology at the University of Chicago, worked as a reporter for the Chicago City News Bureau, and later moved to New York State to write for General Electric as a public relations man. (These facts are also included in the first chapter of Slaughterhouse-Five.) Vonnegut had seven children (three biological, four adopted) and was married several times. He taught at various institutions, including the Iowa Writers’ Workshop. Cat’s Cradle, an earlier novel, and Slaughterhouse-Five brought Vonnegut national recognition and a wide readership, which continue up to and after his death in 2007. Vonnegut was writing Slaughterhouse-Five during the escalation of the American war in Vietnam, a war that was never declared by Congress and was viewed by many Americans as a complicated, unjust, and unnecessary use of US power. As in World War II, the Vietnam War prompted Congress to call a draft, although the divide in public opinion meant that soldiers themselves were caught in a complex political struggle, and after years of battle were made to return to a country that did no always congratulate them for their service. This, and the larger Cold War between the United States and the Soviet Union, the two emergent powers after World War II, form the political backdrop to Slaughterhouse-Five. Reports of men killed in Vietnam ran on the nightly news for much of the late ‘60s and early ‘70s, and the stockpiling of nuclear arms in the US and the USSR continued until the collapse of the latter in the late 1980s. Thus Vonnegut’s World War II novel, describing the deaths of many Germans in Dresden, might be seen as a commentary on more contemporary conditions: a lesson on the horrors of war in any age. The Second World War was perhaps the signal event for a generation of American writers, whose novels in the 1940s, ‘50s, ‘60s, and ‘70s attempted to grapple with the effects of the conflict and the new political and social realities of the Cold War. Joseph Heller’s Catch-22, published in 1961, was a comic novel and investigation of war. Thomas Pynchon’s V. and Gravity’s Rainbow (1963 and 1973) were large, complex works, using labyrinthine plots and comic and surreal passages to come to terms with war’s dislocation and violence. Self-reference. Slaughterhouse-Five includes another feature often associated with postmodern fiction: self-reference, or the acknowledgment of the book’s fiction as the book takes place. Vonnegut uses self-reference throughout the novel to call into question the truth of his and Billy Pilgrim’s report of the Dresden bombings. The technique helps to decrease the distance between the author, protagonist, and reader. Continued popularity. Vonnegut’s books continue to be read in the United States and around the world, often, first, by young people. Vonnegut was concerned with the critical reception of his novels—he did not want to be considered strictly a “young person’s” novelist, nor a “science fiction writer.” But it is the blend of all these elements that make his voice distinctive and exciting. Schlegel, Chris. "Slaughterhouse-Five." LitCharts. LitCharts LLC, 16 Sep 2013. Web. 28 Feb 2019. Schlegel, Chris. "Slaughterhouse-Five." LitCharts LLC, September 16, 2013. Retrieved February 28, 2019. https://www.litcharts.com/lit/slaughterhouse-five.